A delicious pesto made from garden-fresh Tuscan kale, pine nuts, Parmesan and Romano cheeses, garlic and extra virgin olive oil. 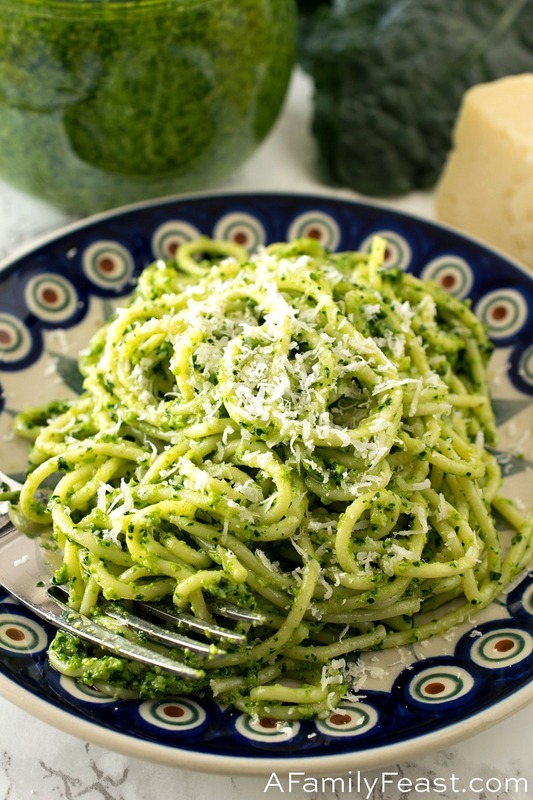 Make and serve this delicious Tuscan Kale Pesto just like you would any type of herb pesto! Hi everyone, it’s Jack. I’m a huge fan of Tuscan kale. In fact, during most trips to the supermarket, I’ll buy several giant bunches and dream up all kinds of different ways to cook and eat it. Today’s recipe – this outstanding Tuscan Kale Pesto – came to us as a suggestion from our friends Sandi and David. As you may remember reading here, Martha and I meet up with Sandi and David once or twice a year, and we recently hosted them at our house for dinner. During our meal, the topic of cooking with kale came up. (What can I say – that’s what fellow foodies talk about over dinner! Food!) Sandi mentioned that they often make kale pesto – and that inspired today’s Tuscan Kale Pesto recipe. 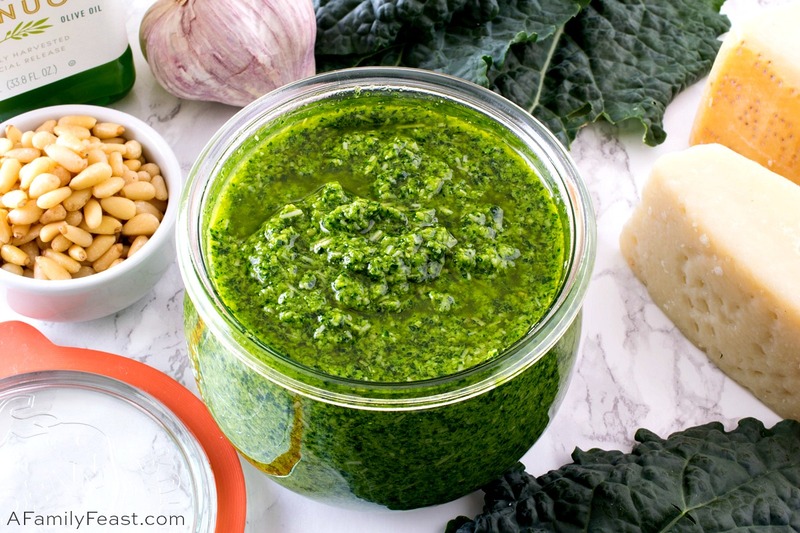 I’ve been growing Tuscan kale in our garden this summer, and it has been growing fast and furious, so I was thrilled to try making this easy Tuscan kale pesto recipe. How do you make Tuscan Kale Pesto? We followed the same approach we take when making our traditional basil pesto – removing the leaves of the Tuscan Kale from the stem, then combining it in a food processor with garlic, pine nuts, a high-quality extra virgin olive oil, grated Parmesan and Romano cheeses, plus salt and pepper to taste. 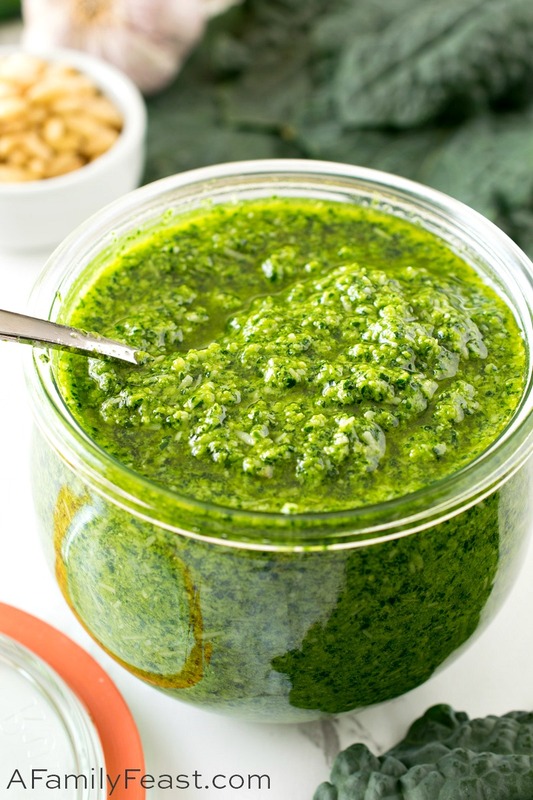 How do you serve Tuscan Kale Pesto? This Tuscan Kale Pesto can be served just like any other pesto – tossed with pasta, on pizza, in a calzone, spooned over fish or chicken, or layered in a terrine like this. 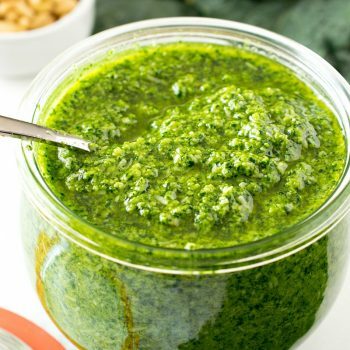 Tuscan Kale Pesto doesn’t oxidize as quickly as its basil pesto cousin, so your pesto will stay that vibrant bright green color for a longer time after mixing. 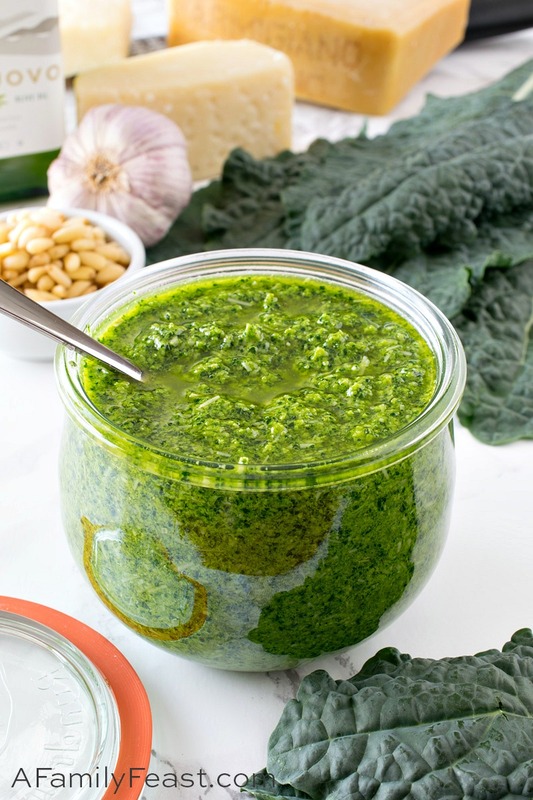 How do you store Tuscan Kale Pesto? Alternately, you can store your Tuscan Kale Pesto in a tall mason jar for up to two weeks in the refrigerator. To avoid any oxidization and discolorization, place a piece of plastic food wrap directly against the pesto before screwing the lid on the jar. P.S. Thanks for the recipe Sandi and David! FYI – We’ll be sharing the rest of the recipes we served at dinner here in a few weeks. In a food processor, add kale, garlic and pine nuts and process until uniformly chopped. 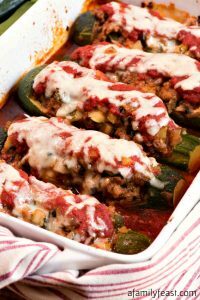 With motor running add olive oil in a drizzle. Open the lid and scrape down the sides then turn motor back on to mix. 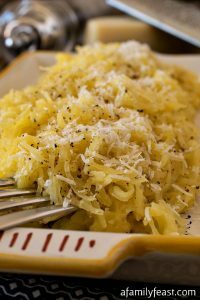 Pour into a bowl and hand mix in both cheeses and salt and pepper to taste. This pesto may also be frozen – we put it in small zipper seal food storage bags and flatten to remove all the air from the bag before sealing and freezing. Over time, pesto will lose some of its vivid green color and turn brownish when exposed to air but there are a few tricks to prevent that from happening when storing pesto in the fridge. First, we try to store it in a taller, narrow container or jar to minimize the pesto’s exposure to air. Pouring a thin layer of olive oil over the top of the pesto before closing the lid will also work, but we find that eventually this makes the pesto overly-oily as it is mixed in, if you are using small amounts out of the jar. As an alternative, we have found that placing a piece of plastic food wrap directly against the top of the pesto before placing the lid on the jar also works well and avoids the ‘overly-oily’ problem. 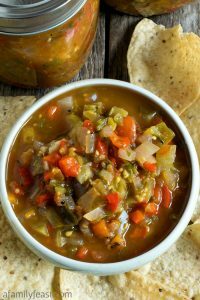 I highly recommend this recipe. I was lucky enough to enjoy it with some of the incredibly favorable tuscan kale that Jack harvested from Martha and Jack’s garden. Yummy!! !